Snow has been the story of the day. Predictions that 12-16 inches of snow would hit Long Island made me decide to work from home today. With Skype, high speed networks, VPN and cellphones I can do anything at home that I can do at the office except get coffee from the Keurig machine in the pantry. Before I started my run I decided to try the traction slip-ons that I recently bought at TJ Max. They are made of rubber and after slipping them over the front of the shoe they can be stretched tightly over the rear for a secure fit. 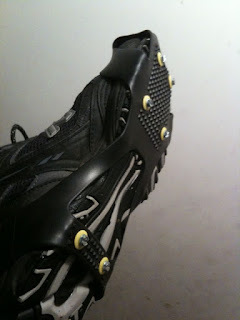 On the bottom are steel studs across the front foot and heel that supposedly provide traction on snow and ice. I set out for my run and quickly noticed that amount of snow was too high to let the snow treads make much of a difference. Further, while the treads were stable front to back they were very unstable from side to side. It was a lot like running on sand and after 1.3 miles of discomfort, I became concerned that I was putting too much strain on my ankles and knees. I decided to head home thinking I would have been far better off just running with trail shoes. I wasn't ready to give up before completing my workout so I headed upstairs and fired up the treadmill. I ran about 2.4 more miles at 9:14 per mile, the fastest pace I've maintained since my recent bout with pneumonia. Although it was a busy day with conference calls and other business related matters I managed to get out and shovel the driveway a couple of times. My wife set the pace and we got through a good amount of snow fairly quickly with my daughter helping as well. I'll admit that I actually enjoy shoveling snow. That said, I am hoping that we're seeing the tail end of the storm so that tomorrow's commute will go smoothly. In terms of activity, I'm not quite done for the day. We'll be heading out around 9:00 tonight for one more round of shoveling. No complaints here. Orange you glad these shirts are so cheap? I may be weak but I'm slow! Spirit, check. Strength, more work needed. Is more time to run worth serving jury duty? Of course I chose the Brooks! Nice guys finish last? Not this one. Do running supplements actually do anything?